Which is better? Are you a Cunard fan? A P&O fan? Have you cruised on either of these ships? Did you think there was much difference in them? What if I told you there was no difference at all? The new Queen Victoria was set to enter service in 2005 and had been ordered a couple of years previously by the Carnival corporation. She was nearly finished when the decision was made that the P&O fleet needed a ship much more than the Cunard fleet so what was supposed to be the Queen Victoria became the P&O Arcadia. Next time you're onboard have a look around the ship and think to yourself Cunard. Have a look at the funnel but imagine it red rather that yellow, (pictured here), the shape is even wrong for a P&O ship! Make your way down to a pub on F deck called the Rising Sun. It's almost identical to every Golden Lion pub I've ever been to on a Cunard ship. If you can't wait just have a look at the pictures on this post. 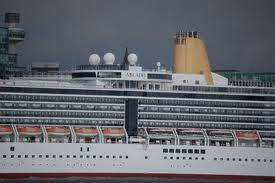 The P&O Arcadia was originally going to be the Queen Victoria - strange but true!